Charlotte Mary Mew (poet) born 15.11.1869, died at her own hand 24.3.1928 in a mental nursing home. Freda Kendall Mew (lunatic) born March 1879, died of natural causes 1.3.1958 in the Isle of Wight county mental hospital. Eugenics, or breeding out the weak and diseased members of society, was a powerful mental health policy in the first half of the 20th century. Charlotte Mew lived in fear that her own mental illness, and that of her family, would be discovered. 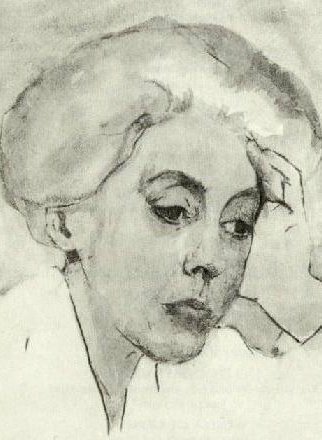 In protest she wrote stories and poems in which mental patients are described positively. One of these was returned by an editor with a note that such people should be in asylums. "Two girls holding each other's hands came in and stood in deep shadow behind the farthest rows of high-backed chairs by the door. The younger rolled her head from side to side; her shifting eyes and ceaseless imbecile grimaces chilled my blood. The other, who stood praying, turned suddenly (the place but for the flaring alter lights was dark) and kissed the dreadful creature by her side. I shuddered, and yet her face wore no look of loathing nor pity. The expression was a divine one of habitual love. She wiped the idiot's lips and stroked the shaking hands in hers, to quiet the sad hysterical caresses she would not check. It was a page of gospel which the old man with his back to it might never read. A sublime and ghastly scene." Charlotte describes the younger sister in the same repulsive way that can be found in text books and reports right through to the middle of the twentieth century, but she adds that the love between the two sisters was divine, and exceeded anything that the priest at the alter might read in a book. In September 1898, the Mews' father, a London architect, died after a long and painful illness. 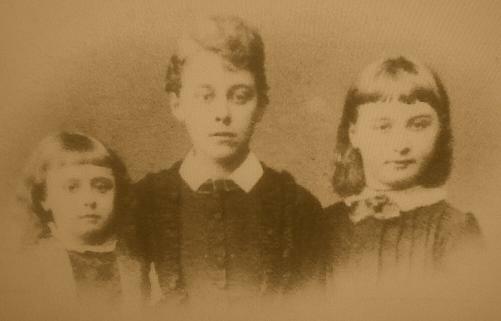 Charlotte and the middle sister, Anne, remained in London with their mother. Their brother, Henry, was confined in an asylum before 1890 and, at this time, was probably in a private asylum in Peckham. The other member of the family, the youngest sister, Freda, was living on her aunt and uncle's farm on the Isle of Wight. Henry was twenty eight years old, Freda was nineteen. In November Freda became insane and was sent to a local nursing home called The Limes. From there she was certified and admitted to the private wing of the Isle of Wight County Asylum in January 1899. Henry died in the Peckham asylum in 1901. He had caught tuberculosis, a common asylum disease. Mrs Mew was looked after by Anne and Charlotte until her death in 1923, after which the older sisters continued to live together as companions. They had resolved many years ago that they would not marry, for fear of passing on the taint in their blood-line. In 1927, Anne, like her father, died of cancer. Distraught, and deluded that cancer germs were attacking her from the air, Charlotte swallowed disinfectant in a mental nursing home in 1928. She was buried with Anne. Freda lived in the Isle of Wight asylum until she died in 1958. This history has taken historians many decades to extract, the Mew family kept it very secret. Charlotte would not provide any biographical details at all to her publishers. Freda Mew's medical case notes survive for the eleven years from 1898 to 1909. Surprisingly, they do not mention her father's death. The "supposed cause" of her insanity was "probably hereditary", there being a family history of insanity in her brother [Henry] and sister [presumably Charlotte]. Although detached from Freda's social circumstances, we can use her case notes to draw a picture of her as an asylum lunatic. From Charlotte's poetry we can imagine what Freda might have been outside the asylum. February 1899 For the greater part of her days, in her first weeks on the ward, Freda sat with an open book or newspaper, "without apparently reading", "hiding her face". She never spoke of her own initiative and "barely answers when spoken to". From what she did say, the doctor concluded she had "delusions of persecution". Case notes are at first weekly, then monthly. At the end of the fourth month they become quarterly. This means Freda was now regarded as a chronic case. The best that could be said for the next year is that Freda put on weight. In May 1900 the case note say "For the last three months" [Freda] "has scarcely spoken a word" and "takes not the slightest notice of anything said to her". As 1901 moves into 1902, Freda sits listlessly and dribbles, "perfectly stuporous". She has "dirty habits", wetting and soiling herself. At this stage the doctors decided to try a relatively new treatment advocated for "patients who had not benefited by the ordinary routine treatment of insanity". Feeding thyroid, as a tablet, started a fever and, in some cases, relieved the mental illness. Freda's case notes show no improvement. In 1906, the notes change. At first Freda sits "doubled up" in the chair but, from 1907, she spends all day in bed. She resists any kind of examination, but her body appears to be wasting away. No organic disease can be found, but it is difficult to tell because Freda kicks and bites anyone who comes near. By October 1907 she is "extremely emaciated", even though she "eats ravenously like an animal". Throughout 1908 she "lies curled up and will not say a word or take any notice when addressed. In feeble health." Only two entries are made, this one in January and another in October that says she is "exactly the same". Had you walked through the private ward in 1902 you would have recognised Freda as the dribbling idiot sitting listlessly in her favourite corner. In the medical language of the day, she was suffering from dementia - the state of stupidity that one is not born with (which is amentia) but which follows as a natural consequence of mania, or agitated madness. German doctors called the whole process, from agitation to stupidity, dementia praecox (early dementia). Later, they changed the name to schizophrenia. In one of Charlotte's poems, she meets the patients from the asylum "On the Asylum Road". The patients, are the "incarnate wages of man's sin" - A reference to the recent discovery that syphilis was the cause of General Paralysis of the Insane, a disease that destroyed many in early 20th century asylums. In "Ken" she follows Ken on his life's journey to the asylum. In this, the most controversial of the asylum poems, she suggests that the asylum itself destroyed the person. This was the poem that editors refused to publish. It is also a world, that Charlotte has been to, and in which she wrote some of her poetry. A verse she wrote "In Nunhead Cemetery", after Henry's death, was, she said "a lapse from the sanity and self-control of what precedes it. The mind and senses can stand no more". Charlotte says that the people from the asylum are the "saddest crowd that you will ever pass". She is not romanticising mental illness, but she is listening to the voices, within and without. In reading Freda's case notes, one is aware that Freda and the staff live in mentally different worlds. Charlotte describes this mutual lack of perception as windows of clouded glass. It appears that the mad cannot see into the sane, or the sane inhabit the world of the mad. Even though we crack jokes with one another on the asylum road, we are divided from one another by the same dark glass that is used in the asylum. "Sometimes, in his evil fits, you could not move him from his chair - You did not look at him as he sat there, biting his rosary to bits." This description of Ken is so like Freda, and when Charlotte says "you did not look at him" it is an accusation. You did not look at what Ken was doing, you did not try to understand why he was biting his rosary to bits. Perhaps people did not try to understand why Freda was trying to get through the asylum windows.